After the Ethyl-Dow lease of the Breakers Hotel ended in 1934, the hotel was once again open to the public. This ad from the Sunday Star News, dated May 27, 1937, shows a couple dancing in the moonlight and boasted surf bathing and fishing from the surf in front of the hotel. Strangely, it also mentioned that they had hot and cold water. The hotel was operated on the American Plan which means that all three meals, breakfast, lunch and dinner were provided with the room rate. The manager that summer was L. Gurkin. The Breakers Hotel remained open during the war years that followed in the 1940s. During WWII, the coastal areas and 20 miles inland complied with blackout rules and regulations. Along our beaches residents used blackout shades in their homes, painted the top half of auto headlights black and the like. We are fortunate to have an account of a stay at the hotel during war time. In July of 2010 we had an inquiry at the History Center about the Breakers Hotel. I happened to be volunteering that day and took a call from Betty Jinnette Williamson asking about the hotel’s history. After a little research from our archives, I emailed her a brief overview and she replied thanking me and giving an account of her family’s stay at the Breakers during WWII. This is wonderful! — how kind of you to give me such details about The Breakers Hotel history. My sister and I were there with our parents during W.W.II. Our mother had just recovered from virus pneumonia. The staff would bring a cot out on the sand in the mornings so that “Mother” could get her needed sun for healing. Many officers’ wives lived there with their families during the war. I was a child and so enjoyed playing with the other children and sitting on the porch at night in the dark because of the “blackout.” It was also quite grand to eat in the huge dining room with a soaring ceiling. There were early seatings to insure enough light to see by. I recall either a kerosene lamp or perhaps a flashlight used to climb the staircase later at night – to our bedrooms on the upper floors. You have really filled in the empty spaces in our memories regarding very special summers. Now we know where it was located! We came to Carolina Beach every year smiling in anticipation. However, when we had to leave it was hard to hold back our tears. Mrs. Williamson graduated from UNC Chapel Hill in 1957 and moved to New York City after that and was living in Norwalk, Connecticut at the time of our email exchange in 2010. She was visiting her sister in Fayetteville that summer and they came to Carolina Beach for the day to “put our toes in the warm southern ocean”. 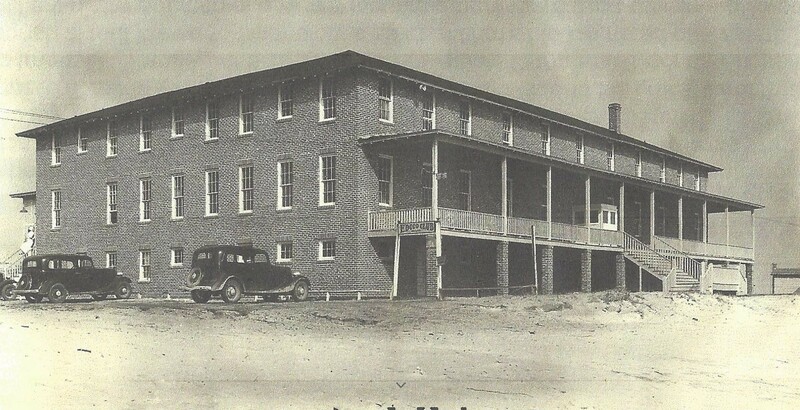 They began reminiscing about their summers spent at the Breakers and wondered where it used to be located so they called the Town of Carolina Beach who referred them to us. Not only were her emails wonderful pieces of information for our files at FPHPS, they were also an affirmation of how much our work is appreciated by our community and those who have visited our beach towns over the years. It also affirms how important it is for us to be here.